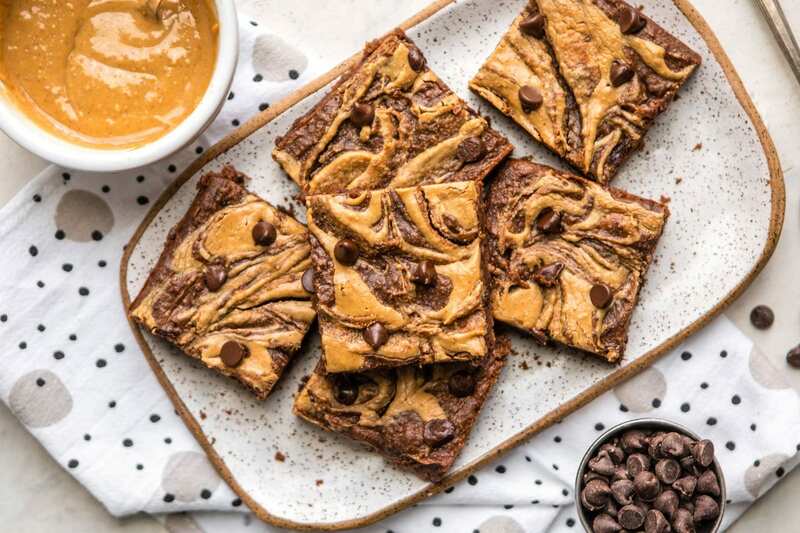 Not only are these Peanut Butter Brownies fudgy, decadent, and delicious, but they’re also Vegan, Gluten-Free, and made from only 9 healthy ingredients! 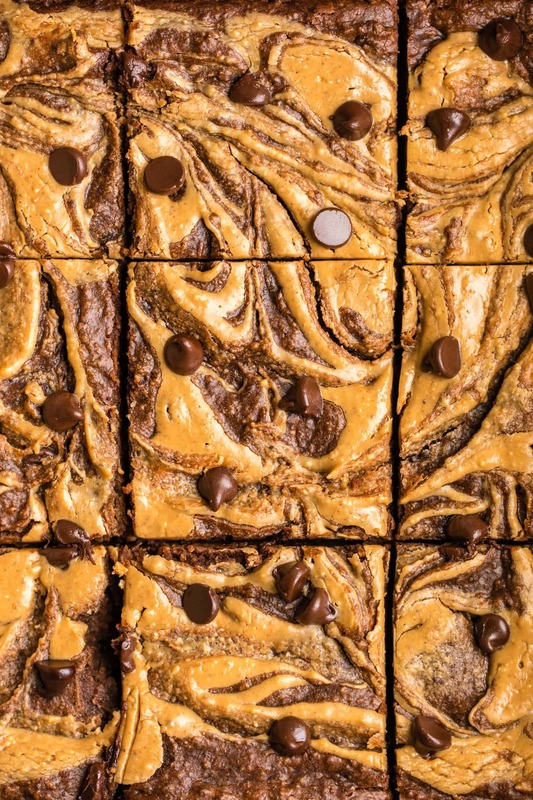 Chewy edges, fudgy centers, and a rich, chocolatey flavor — these Chocolate Peanut Butter Brownies check all of those boxes, and then some. Why, you ask? Well they’re also Vegan, Gluten-Free, and made with only 9 healthy ingredients! Most Brownies taste delicious, but are filled with more Butter, Sugar, and Oil than anyone would care to admit. Well friends, that’s not the case here! 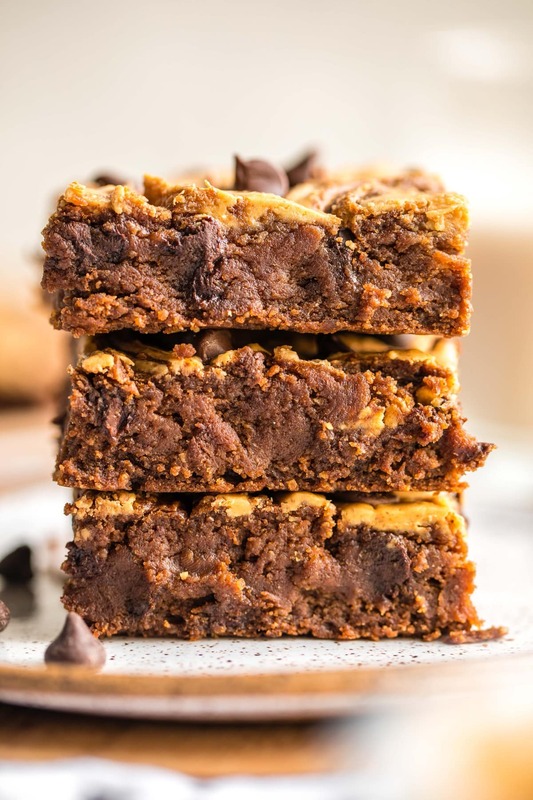 I decided to naturally sweeten these fudgy squares with Coconut Sugar instead of regular sugar, and skip the Oil in place for extra Peanut Butter. And let’s be honest, here — is there ever such a thing as too much Peanut Buttter? These Brownies (in my opinion) are the perfect balance of fudgy, fluffy, and sweet-but-not-too-sweet. 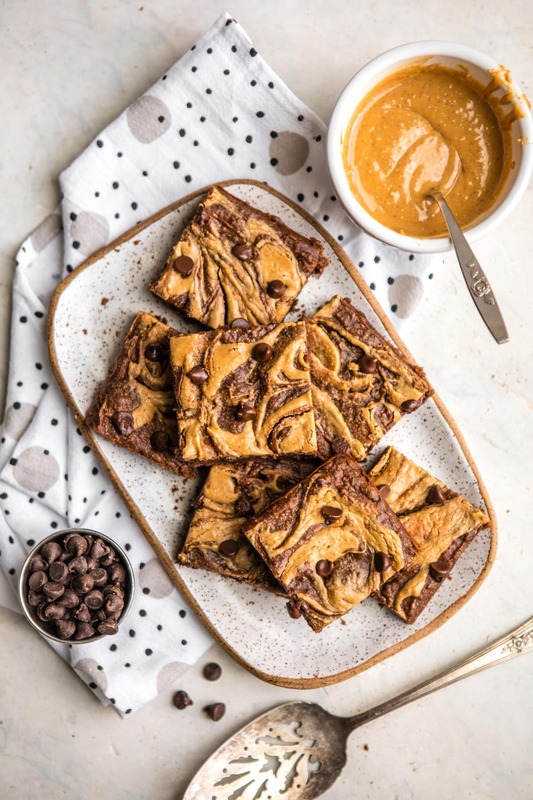 My Almond Butter Brownies are on the slightly fudgier side if you wan’t to go that route — both are good options! I mean, can we take a moment to appreciate that cross-section?! 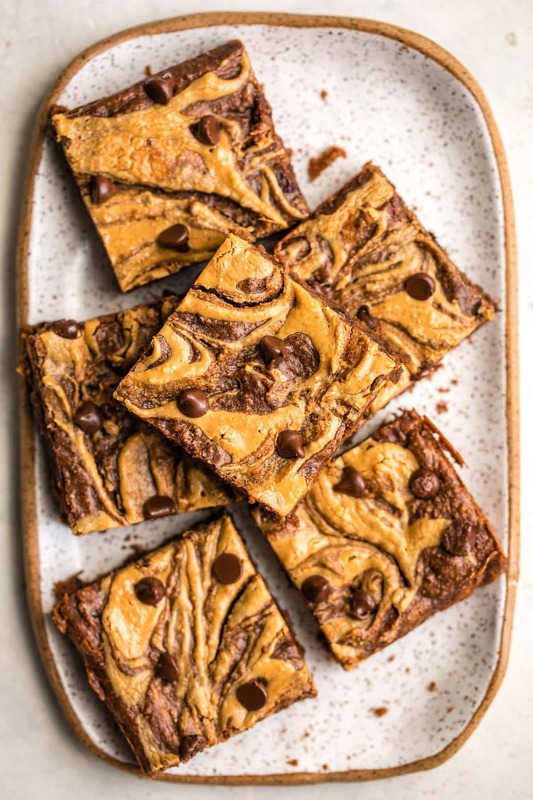 I like to warm these Peanut Butter Brownies up in the oven and serve it with a glass of Non-Dairy Milk, but they’re still great at room temp. Oooor you could deck it out with some extra Nut Butter and/or Ice Cream on top. However you choose to serve them, these Brownies are great for adults, kids, parties, and solo date nights — basically, they’re perfect. Nut Allergy? Feel free to replace the Peanut Butter with Sunflower Butter, Tahini, or even Coconut Butter! I would recommend using Parchment Paper to line your baking tin instead of greasing the pan – it makes the Brownies a lot easier to remove. If you’d like to keep these Brownies Refined Sugar-Free, both Hu Kitchen and Pacari make Chocolate that is naturally sweetened with Coconut Sugar! If you’re looking for more Chocolate Dessert recipes, you’ll also love this Chocolate Hazelnut Pudding Pie, Double Chocolate Chip Cookies, and these No Bake Chocolate Peanut Butter Cookies! Preheat the oven to 350F. Combine the Ground Flax and water together in a small bowl, and set aside to let thicken for 5 minutes. In the meantime, add the Oat Flour, Cacao Powder, Baking Powder, and Salt in a large bowl and whisk until well-combined. Form a well in the center of the bowl, then add in the Non-Dairy Milk, Peanut Butter, Coconut Sugar, Vanilla Extract, and thickened Flax Egg. Mix until a thick batter forms, then fold in the Chocolate Chips. Pour the batter into a greased or lined 9×9″ baking tin and spread it around evenly with a spatula. If you’d like to make a Peanut Butter swirl, spread a thick drizzle/”dollop” of nut butter around the top of the batter, then use a butter knife to swirl everything around. Bake for 20-22 minutes, then let cool in the pan for 10-15 minutes before removing. Transfer to a cooling rack and let cool completely before slicing. Store any leftovers in a container with a loose-fitting lid at room temperature for up to 5 days. To make Oat Flour, add 1 cup of Quick-Cooking or Rolled Oats to a blender and process until smooth, about 30-45 seconds. I used about 1/4-1/3 cup of extra Peanut Butter for the drizzle on top of the Brownies. Coconut Sugar may be replaced with Brown Sugar. I can’t wait to try this recipe! 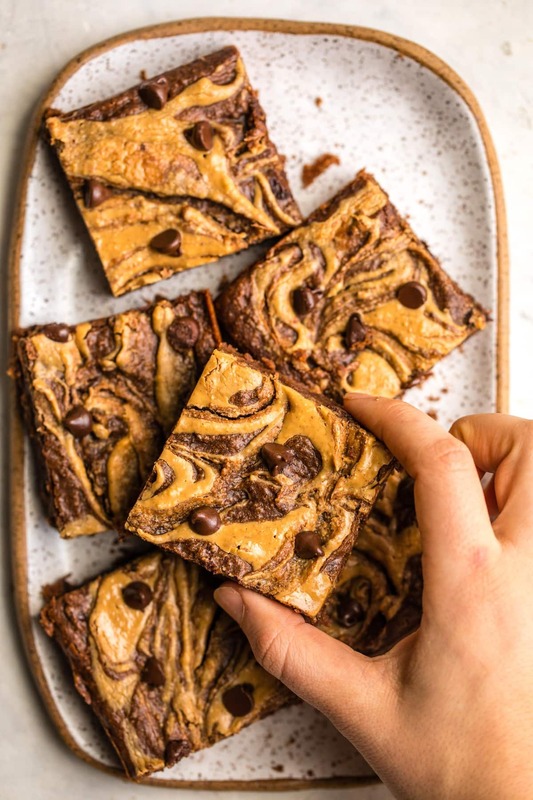 Before I went vegan, I had an amazing GF peanut butter swirl brownie recipe from a different blogger but it was made with eggs and yogurt and too hard to veganize. I’m not gluten free but I find gluten free brownies are usually so much fudgier and denser then their glutinous counterparts. 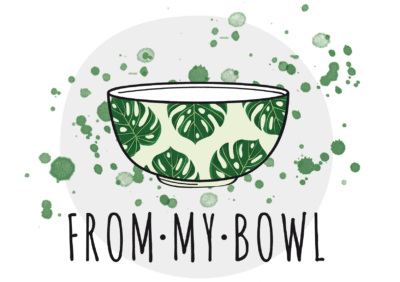 Love your blog Caitlin! OMG these look delicious! I’ll be making them in the near future. Can I use regular kraft smooth peanut butter? Hi! I love your recipe! I want to ask you if I can replace the oat flour with another tipe of flour (like rice flour). Hi Ursula! I haven’t tested this with any other flour – Brown Rice would probably work, but you may need to use slightly less as I believe it is more absorbent. Let me know how it works for you if you try it! Just made these (minus the pb swirl cause I was lazy lol) & they’re so goooood! I like them cause they’re rich, so even a small piece satisfies you! Yay! Glad you enjoyed them, Devan! These look amazing! Do you think I could use PB2/peanut butter powder to replace the peanut butter? No, I would not recommend that. 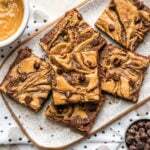 You need the fat from the PB in order to make these fudgy! Can you give me the nutritional info for this recipe? I am diabetic, and cannot have much sugar. Thank you. This recipe looks amazing! Unfortunately, I don’t have any chocolate chips on hand… can these be omitted (worse case scenario) or would you recommend an alternative (i.e. chopping up chocolate pieces)? Thanks so much, I’m so excited to try them. I made these over the weekend and they came out so good. I did a mix of coconut sugar and organic granulated sugar but otherwise followed the recipe. I would definitely make these again! Yum! Thanks for the review, Molly! I used to work at this restaurant called Tender Greens that served the most delicious vegan peanut butter brownies. They were moist, gooey, and the peanut butter was crisp on the outside. I could have easily gained fifteen pounds in the three months I worked there, haha! But you need self-control sometimes, ya know? It’s fantastic that I’ve found this recipe because I can make them on my own now! Good thing they’re a lot healthier and they are gluten-friendly and oil free because the brownies from Tender Greens sure were not, LOL! These are soaking good! Made them yesterday. Of course yours came out prettier than mine. They are super hearty. Usually my son would have several but one did the trick for snack time. Keep the vegan keto recipes coming!!! Thank you Caitlin! My friends and family loved these!! They came out super fudgy and good. Thanks Caitlin! Hi ! Thank you ! Your recipes are just amazing, allergy friendly and vegan. I just made these fantastic brownies above all for a friend who doesn’t “believe” in vegan recipes, I used a cupcake pan for the fancy side and added unsweetened shredded coconut+ a pinch of cinnamon. There are so fluffy and chewy I bet not like yours. Is it normal the bitter taste ’cause of ground flaxseed? Good luck and big kisses Caitlin from Morocco 🙂 ! These brownies were so delicious!!! I’m looking forward to making them again!! These were delicious! I did have to bake longer than 23 minutes but most recipes I bake in my oven take longer than the recipe says (don’t know why). So I’d recommend anyone else check them with a toothpick after 23 minutes and if it comes out wet keep baking in 2 minutes increments until done. Mine took 30. Other than that I did the recipe exactly as written, swirl and all! Thanks, Hayley! The brownies will still be semi-soft after 23 minutes, but they firm up as they cool. You don’t want to bake them for too long, or they wont be as fudgy! Hi Caitlin! Do you think a chia egg would work as fine as a flax egg? This recipe looks extremely delicious! !